“It was a great group that joined me for a snowshoe up to the Windy Joe fire lookout. It was a pretty uneventful, straightforward drive and hike – which personally was appreciated after a few recent misadventures! Particular thanks to Lisa for driving all the way out from White Rock, Phil for bringing homemade cookies, Haiying for supplying zip ties for makeshift snowshoe repairs, and Gail for good conversation. “Four of us – Tamara, Gary, Xiru, and myself – hopped into my car bright and early, and reached the trailhead in slightly under 2 hours. I wasn’t sure what to expect from the hike but it was far more enjoyable than I’d imagined. It may have Grouse Grind-like stats but it couldn’t be further from the Grind in terms of interest. 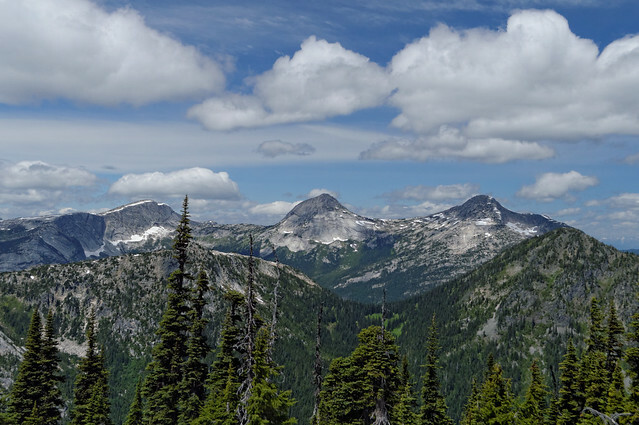 Gorgeous mid-elevation forest, views, a bit of gentle scrambling, blueberries, marmots, and more views. For sure, the trail *is* steep, and would need care in a few places if wet or snowy/icy. Despite its imposing appearance, the summit of Yak is quite safe with plenty of space to lounge around for lunch while soaking in the awesome 360-degree vista. Be sure to venture over to a bump on the way to Nak Peak (which we called the Naklet) for a stunning view of the north face of Yak. Despite being a short hike, we took our time and we were reluctant to leave. But the Blue Moose beckoned…! “A lovely mid-week excursion on a fine trail, this hike was nicer than I remembered. Bob and Tec joined me to meander our way up to the summit at a leisurely pace. As we got back to the car we decided to head in to Falls Lake to check it out – pleasant enough though very windy, it added less than half an hour to our trip. We were finished within 5 hours. 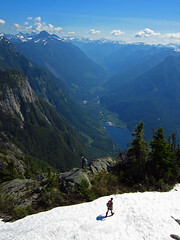 The trail was in good condition, though still a little wet at higher elevations where some snow remains. In places the trail is a small running stream, but perfectly manageable with hiking boots. There are a couple of excellent rocks for lunch spots with a great view of Alpaca, Vicuna and Guanaco. Thankfully there were far fewer bugs than on my last visit a couple of years ago – I got only 3 bites compared with 120 last time! It was quite breezy, which seemed to keep them at bay. Plenty of flowers out, but I think the best is yet to come. Glacier lilies are probably at peak bloom near the summit (a bit beyond the obvious viewpoint); they’re well past it on the open southerly slopes. Other flowers include (deep breath! ): paintbrush, lupine, orange agoseris, valerian, arnica (at least 2 species), columbine, wild strawberry, buttercups, cinquefoil, thistle, marsh marigolds, globeflower, western anemone, rosy twistedstalk, queen’s cup, green bog orchid, phlox, spring beauty, meadowrue, larkspur and a columbia lily or two. No animal sightings but we did find what we thought was mountain goat wool snagged on the heather, and saw a foot hoof-prints in the mud. The wool was incredibly soft and fine.